1. First ladies (or wives of world leaders) seem to experience decisions just as much as the President or the world leaders do. 2. When Senator Stevens was faced with the decision to — essentially — speak out against everything he’d been fighting for over the last 30 years, I wondered — would I be able to do that? Would you be able to do that? Of course, we can bring in Bentham‘s utilitarianism to help us explain doing what’s best for the “greater good,” but I still think it would be a difficult decision. Especially today, in the information age, when everything you say or do is kept — seemingly — forever. 3. Lincoln, in pursuing the abolition of slavery, had to know that he might lose his life. The day he died was not the first assassination attempt. So, in pursuing what he was pursuing, he had to know that he might die. The lesson here: would I be willing to give my life for a cause or a belief? Will there be a time when I’m faced with such an instance where I would give my life for what I believed in? Will you? 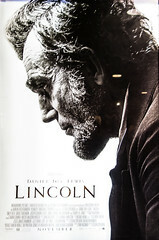 Would you have given your life in the way Lincoln did? After I ask those questions, the thought occurs to me: Lincoln may not have seen it that way. he may not have seen it as, “I could die for this cause, so I should weigh the pros/cons.” My sense is that it might not even have been a question for him. He just knew that abolishing slavery was what he had to do — no matter the cost. This entry was posted in Entertainment, Wisdom and tagged abolishing slavery, abolition of slavery, Abolitionism, Abraham Lincoln, Daniel Day-Lewis, Lincoln, President of the United States, senator stevens, Steven Spielberg, Stevens. Bookmark the permalink.